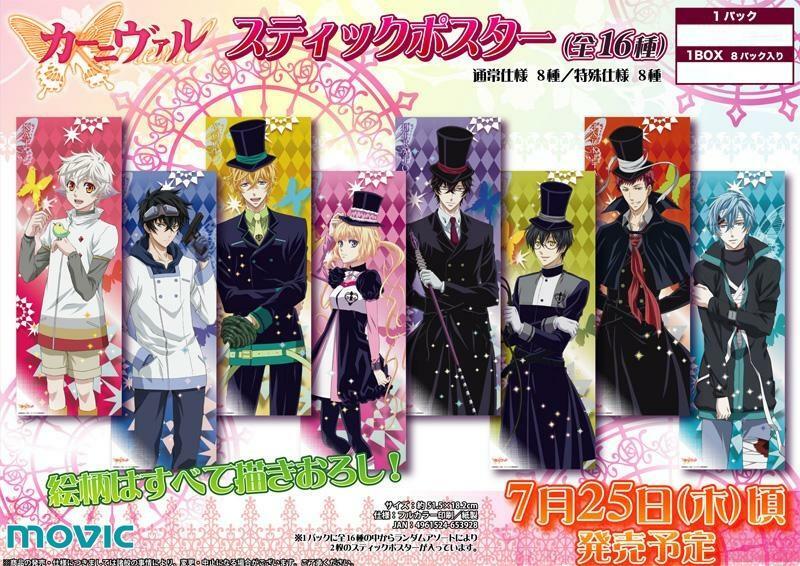 Karneval Stick Posters are coming!!! They are being released at the end of July, so around the end of August is when I should get them~ Each set comes with a shiny pearl version and a normal version as always~ Let me know which character and which version you would like to reserve ^___^ Stick posters will be $10 each!! LOOOL Let's hope that that doesn't happen! I'm already fickle enough and I shouldn't give into that and choose everything...but we'll have to see once the other two are revealed, I suppose. ...and I just realized that you called me 'blackie' LOL Didn't know I was this slow. Linna-chan, I would like to reserve Hirato shiny pearl version :D! Linna-chan, Would you please put me down for secret 2 shiny pearl version? Okie dokie! So it'll be Hirato and Secret #2 shiny for you =) Ah, but I told blacknightsky that since she reserved Secret #1, she'll get to choose first which of the secret posters she likes. Are you okay with that? Oh please put me down for a poster of Yogi too, although I'm not really sure what the difference is between the shiny and normal? Although, I guess it's kind of in the name lol. I honestly don't know which one though? Hmm yeah, I can't really tell the difference between them haha, maybe different shades of color? Maybe? And shiny? But I guess it would be easier to see the difference in person. But hey, I'm a sucker for shiny things, so shiny Yogi it is! Hehehe yeah, I guess the only real difference is the type of paper they use =P Alrighty, I'll put you down for shiny Yogi!! Hihi!! Your Shiny Yogi poster is here ^___^ Would you like to take a look at my other sales updates and see if you want anything else? Or are you ready for me to ship?